Oakland’s Geography of Resistance was a series of workshops and exchanges (“Encuentros”) between youth from various organizations in Oakland who are working to challenge institutional violence through the arts. The young people at BAY-Peace were the primary drivers of the project, tasked with coordinating and scheduling all events. Together with adult mentors, we used interactive theater, poetry, film and dialogue to address issues of gentrification, food access, border violence, Afrocentric cultural promotion and community control, among others. Food Justice July 1, Fresh Fellows/Self-Help Hunger Program at Driver Plaza in North Oakland--BAY-Peace youth and Phat Beets interns harvested greens from Dover Street Park, and then prepared a meal for the community at a small public park that is under attack from gentrifiers in North Oakland. We also created a flower mandala and planted fruit trees in the park. Resiliency, harvesting and cooking, displacement and homelessness were themes we explored. Community Control July 7, Qilombo in West Oakland’s Afrikatown --BAY-Peace youth led a Theater of the Oppressed workshop that explored issues of gentrification and Afro-Centrism. We then received a guided tour of the Qilombo Center and surrounding area to learn about the struggle that is being waged to keep community control of this rapidly gentrifying neighborhood. Youth Expression Encuentro 4, July 21, Cypher with Youth Together at Champions for Humanity Park--BAY-Peace youth performed dance, song, poetry and image theater, and then led a Theater of the Oppressed workshop for Youth Together and members of the public. Migrants’ Rights July 28, at the site of 67 Sueños Mural at Coliseum College Prep Academy--Youth from 67 Sueños explained the history captured in their new mural. We then gathered under a tree to share a meal, build community and learn from each other with some Theater of the Oppressed activities led by BAY-Peace Youth. 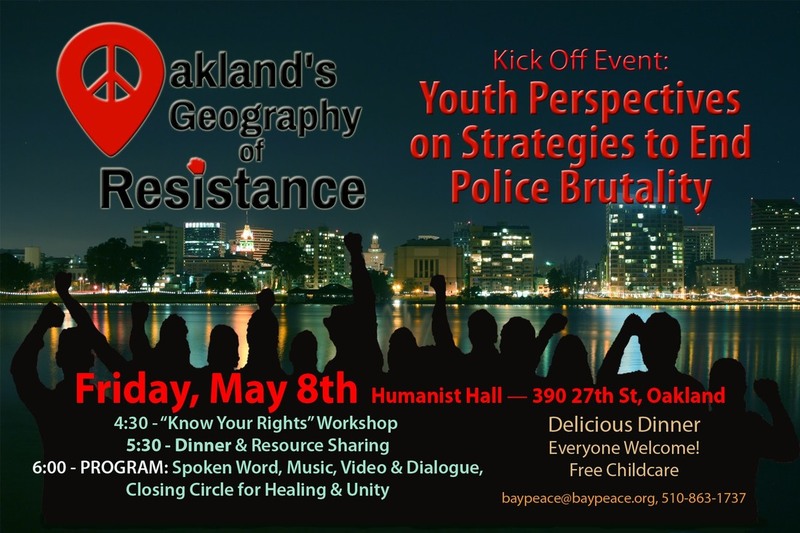 The May 8th kick off event at the Humanist Hall, titled Youth Perspectives on Police Brutality, brought together 150 people—youth and adults. The 6 hour event included dinner, a youth-led “Know Your Rights” workshop, a resource fair, a full program with poetry, dance, interactive theater, political analysis and a healing ritual. Our Grand Finale Event was on November 13th at Eastside Arts, and was built around the interactive online map we created to display our project. The event was attended by over 100 people— youth and adults. It featured a Forum Theater piece: “Wait, Who’s the Enemy Again?” to address interconnections of police violence in schools, militarism, military recruitment, and zero tolerance. This piece honors Raheim Brown and Alan Blueford. The audience also enjoyed poetry, the six Encuentro videos—presented within our Interactive Oakland’s Geography of Resistance map—as well as the final presentation for “Voices of Formerly Incarcerated Youth,” a storytelling/performance project with youth serving sentences at Camp Sweeney. We are very proud to unveil an interactive map featuring the six short videos produced in the OGR series, in addition to resources for responding to structural violence. By clicking on the streets of the map, visitors are able to explore the positive community action that is happening across Oakland’s neighborhoods. As we share this platform with our community, we receive feedback about what more to include and how to make it more comprehensive. We want to be able to continue mapping our ecosystem of youth resistance to institutional oppression. We are inspired by similar mapping projects by Youth Radio, for example, and are hopeful about new directions for collaboration. To this date, our collaborative aspects have been limited to interpersonal communication and arts-based modalities for in-the-moment expression of ideas. We envision being able to collaborate on new technological methods for recording and capturing our interactions. Urban Peace Movement, United Roots, Restorative Justice for Oakland Youth, 67 Sueños, Aunti Frances’ Self-Help Hunger Program, Phat Beets Fellows, North Oakland Restorative Justice Council, Communities United for Restorative Youth Justice, Qilombo, and PUEBLO.